Features you'll enjoy and the family will love. In addition to exceptional features available on the 2019 Mitsubishi Outlander, our Concord, New Hampshire Mitsubishi dealership's goal is to provide incredible service, and fair, honest pricing. New Hampshire drivers benefit from the following when purchasing from Lovering Mitsubishi: free NH state inspections for as long as you own the vehicle, $19.95 oil changes, and Mitsubishi's 10 year/100,000 mile warranty. Allow our expert sales team to assist you in finding the perfect Mitsubishi SUV for you. The 2019 Outlander has standard third-row seating for family, friends, and everything in-between. Need more room? Fold down the second and third row seats for space that fits your needs. Drivers in Nashua, NH can rest assured they will have plenty of space to accommodate all of their needs. The 7" Smartphone Link Display Audio makes switching playlists, getting directions, and safely accessing apps with Apple CarPlay™ and Android Auto™ simple. All it takes is a tap. Available Super All-Wheel Control combines several advanced technologies to give you maximum traction. The Active Front Differential (AFD) distributes engine power between left and right on the front axle. 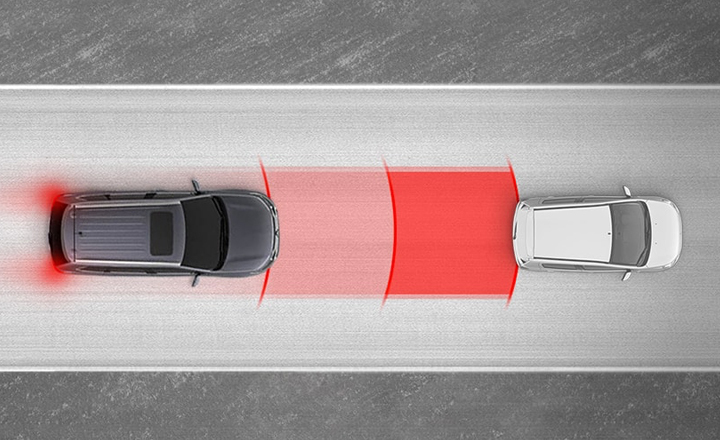 Active Stability Control (ASC) helps keep the vehicle on its intended path when cornering and the Anti-lock Braking System (ABS) along with Electronic Brakeforce Distribution (EBD) improves control and stability under hard braking. And with four driver-selectable modes, including NORMAL, SNOW, LOCK and the AWC ECO Mode, the Outlander is ready to help you handle various conditions. The smooth-accelerating CVT (Continuously Variable Transmission) is designed to use less oil for even greater efficiency. Feeling a bit more sporty? The 3.0-liter MIVEC V6 has a 6-speed automatic for a powerful engine that's both clean and efficient. 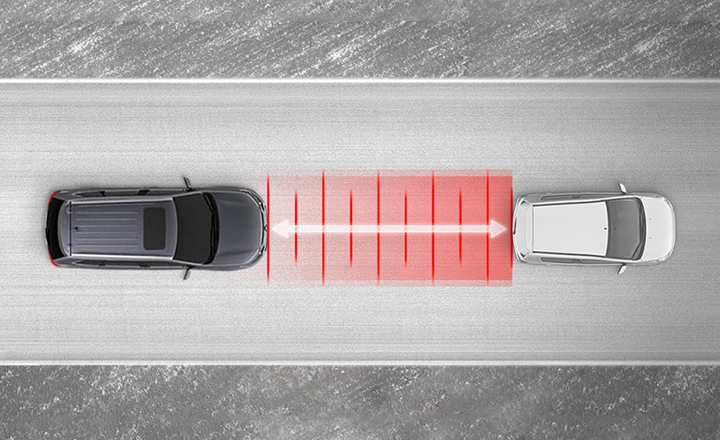 The available Adaptive Cruise Control (ACC) system uses radar technology to judge distances between you and the vehicle ahead, helping you maintain a safe driving distance. If the car moves out of your lane or goes beyond your set speed, the system will resume your set speed. 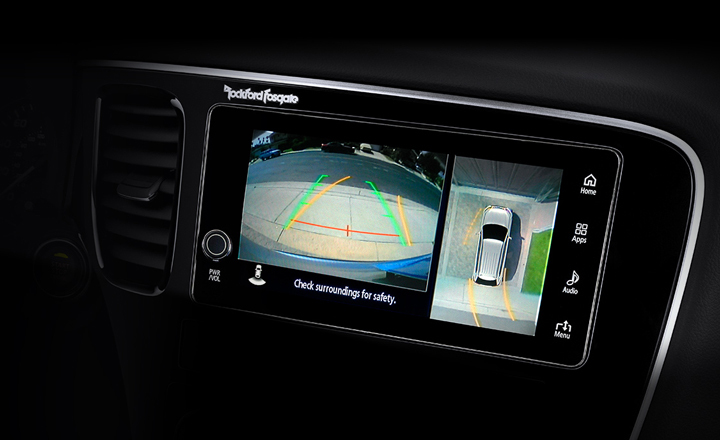 This advanced feature uses multiple cameras around the vehicle to create a composite, bird's-eye view of your Outlander in addition to a wide-angle view, helping to show what's directly behind you. 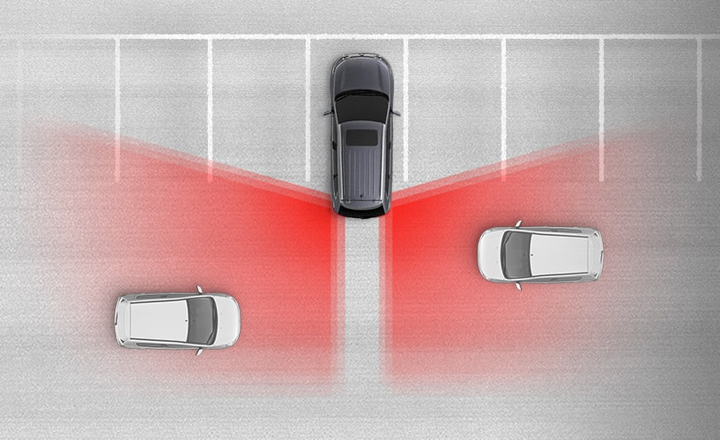 When the Rear Cross Traffic Alert system detects a vehicle approaching from the side while you're backing up, the warning lights on both side mirrors will blink, a buzzer will sound to alert you and a warning message will appear on the information screen of the color multi-information display. 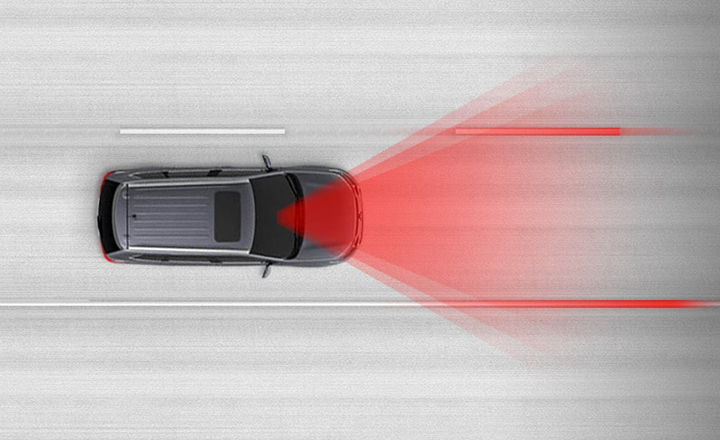 The Forward Collision Mitigation (FCM) system utilizes both laser radar and camera technology to determine if a frontal collision with a vehicle or pedestrian is imminent. If so, it warns the driver with audible and visual signals, and automatically applies moderate to emergency braking to reduce the severity of the collision and, if possible, prevent the collision. We stand behind what we build. Period. 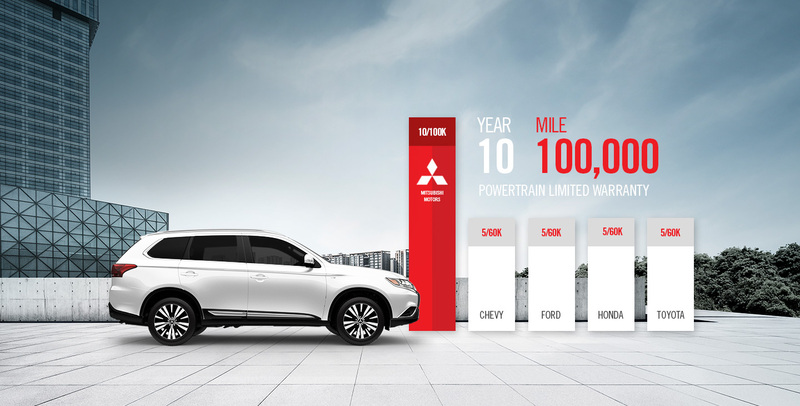 Mitsubishi vehicles are backed by a 10-year/100,000-mile Powertrain Limited Warranty , a 5-year/60,000-mile fully transferable New Vehicle Limited Warranty, a 7-year/100,000-mile Anti-Corrosion/Perforation Limited Warranty and 5-year/Unlimited Miles Roadside Assistance. WHICH OUTLANDER IS RIGHT FOR YOU? "Loved this place! Helped me make correct choices and guide me to the right Outlander vehicle and also what type of financing would be best for me!" Looking for More Outlander Info? Our Mitsubishi dealership located in Concord, NH servicing Manchester, Nashua, and beyond is prepared to assist you in finding the perfect new or used Mitsubishi. Our team of qualified individuals can help you choose which Mitsubishi model will work best for your needs and lifestyle and then work to narrow down which trim will give you all of the features and options you are looking for. Additionally, we have exceptional Outlander lease and finance options available and can work with your budget to get you driving your next vehicle. Speak to one of our Mitsubishi experts and allow us to assist you in finding a new Outlander that will be the best fit for you. Schedule a test drive at your convenience and see how the Outlander handles New Hampshire's roads.